I'm very thankful to have married into the Remington Man's family for many many reasons and one of them is the wonderful blessing of potatoes and onions. So easy, so good, so plentiful, and you are always left wanting more. 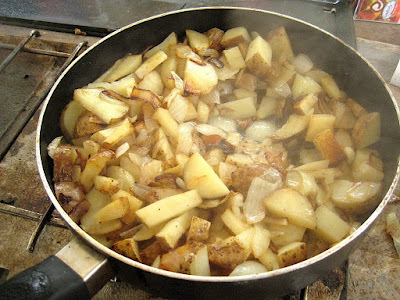 Step One: Cut up potatoes and put them in a hot pan (add cooking spray if on a diet if not add oil) Cover. Step Two: Cut up onion and put in with the potatoes. Cover. Step Three: Stir occasionally to keep them from sticking and burning on the bottom of the pan. Step Four: Remove when potatoes are squishy and onions are see-through"ish". 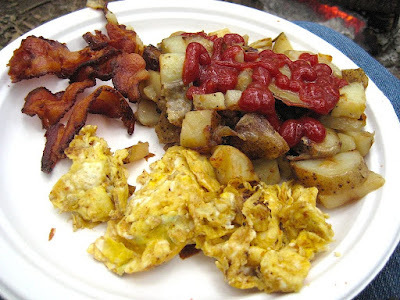 Step Five: Eat with Ketchup! P.S. I have learned from experience that potatoes take longer to cook than onions so make sure they get going first! Enjoy! See other Simple Suppers here.